Source: What prompted this emotion? What lies at the root of it? Impact: How is this emotion affecting me now? How is it riding me? 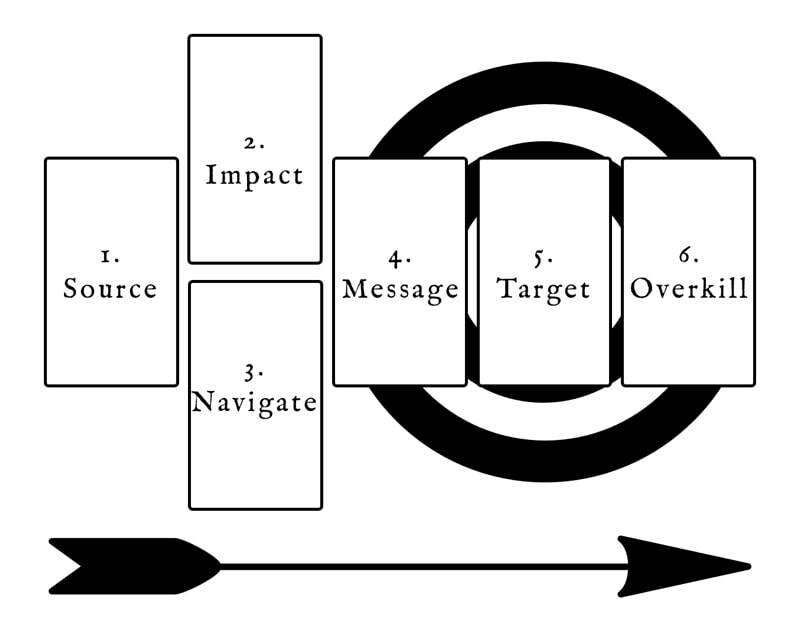 Navigation: How can I better harness, navigate, and channel this emotion? Message: What is this emotion trying to tell me? Target: Best outcome/goal of working constructively with this emotion. Overkill: How does this emotion mislead me? How might it take me too far? Every emotion is an arrow. They can wound. They can guide by pointing where to follow or avoid. This spread is built around two core notions: first, that all emotions have some function, purpose, or encoded message; and second, that by listening to our challenging emotions from a place of neutrality, non-judgement, and openness, we can release them faster. There are more ways than this to relax, and I’m sure you have some of your own. Do your best to get into a peaceful, reflective headspace before prodding questions that call for a level head. The cards can reflect our fears and mirror our feelings back to us when we try to read from a highly charged state, and this can get confusing, even disturbing without the right perspective. They can also deliver tough love and give answers we don’t want to hear. Only ask a question when you’re willing and able to process thoughts about it with honesty and an open mind. The elements air and water shape this spread, challenging us to constructively balance mind and emotion. We need to bring feeling to rational analysis without getting muggy, sticky, or soggy. We need to bring insight and awareness to our feistiest emotions without boiling over. A) Hold the target feeling in mind as you shuffle your cards. This method is affective but tricky, because you want to stay in a state of calm neutrality. Only do this if you can recall your emotion clearly without getting pulled too deeply back into it. B) State the emotion and the purpose of your reading out loud before you shuffle and draw your cards. This is the easiest and most direct method, but some people feel silly speaking out loud while reading for themselves. C) Choose a signifier card that most closely matches your emotion, or a cross of two cards if your emotion is complex, and place this at the upper center of your reading space before you shuffle and draw your cards. 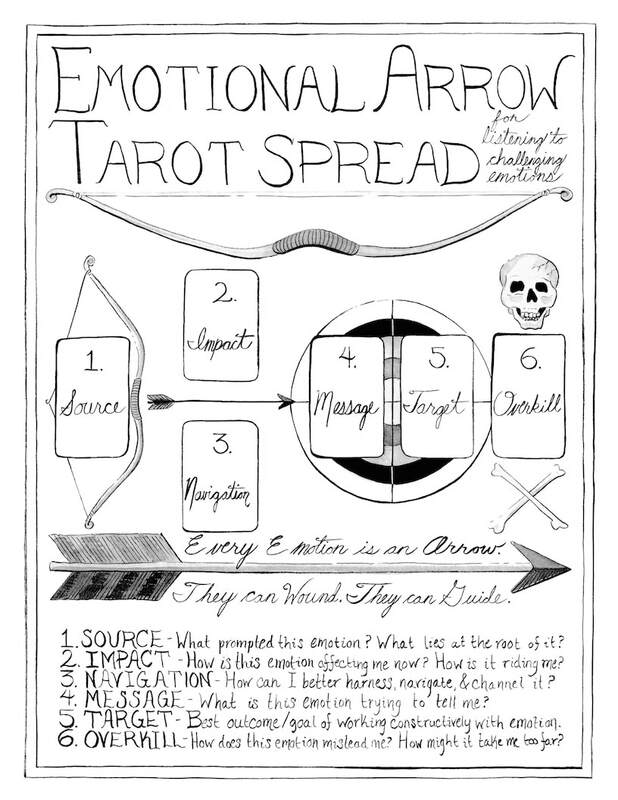 D) Write out your question and target emotion in your tarot journal before shuffling and drawing the cards. Diagram your spread and journal your interpretations. • Open Ended: Draw this spread without setting a specific intention or emotion, and simply see what comes up. You may need to draw a clarifying card after to ascertain the focus. This method is not for the faint of heart. The cards can cut right to something you don’t want to look at. On the other hand, this method can prompt insights on feelings you would never think to ask about. This method may be helpful when experiencing mixed feelings or difficulty describing your current emotions. • Recognizing Challenging Emotions: Emotions we code as negative and undesirable are certainly difficult, but love, infatuation, excitement, eagerness, nostalgia, and all manner of longings can be as challenging as sadness, anger, and fear. For various reasons, some may find emotions like joy, happiness, contentment, and hope challenging. This spread works for a wide range of emotions, positive, negative, complex, and mixed. • Creativity: Try this spread when you suspect a tricky emotion of blocking inspiration or interfering with your creative process. This could include unpleasant feelings like fear, anxiety, self-criticism, imposter syndrome, embarrassment, or even boredom. It could also include more desirable emotions taken too far, like blind optimism or enthusiasm for one part of the process above others. • Career: Reflect and generate perspective when strong emotions are triggered by events or dynamics in the workplace. Question how strong emotions might help, serve, and guide you in your career or your calling. • Relationships: Meditate on how strong emotions affect your relationships, how they express through your relationship dynamics, and how you can better harness or channel them to become a stronger friend, relative, colleague, or partner.